How did the universe begin? In almost all public schools and universities, the most commonly promoted idea of universal origins is the big bang. The idea is that the universe began billions of years ago as a point of infinitesimal size which sprang from nothing and began expanding. Energy became matter which then became stars, galaxies, and planets. Is the big bang really a reasonable theory about how the universe began? Can it be reconciled with Scripture? Is it based on good science? Invented by Georges Lemaître in 1931, the big bang is a conjecture about the very early universe. In the 1920s Edwin Hubble and others found a relationship between the measured redshift and distance of galaxies. Redshift is a phenomenon whereby the light of an object is displaced in frequency toward longer wavelengths from its laboratory frequency. The easiest way to cause redshift is for the object emitting the light to be moving away at high speed from the observer. Hubble found that distant galaxies had higher redshifts than nearby galaxies. This observation is consistent with what we would expect if the entire universe were expanding. Lemaître was quite familiar with general relativity – the branch of physics discovered by Albert Einstein. He found that Einstein’s equations implied that the universe cannot be static, but must either be expanding or contracting. He learned of Hubble’s observations that implied an expanding universe. And these observations seemed to confirm his own theoretical predictions. The universe is indeed expanding. In 1927, Lemaître published his conclusion that the universe was expanding. He even made an estimate of the expansion rate, which today we call the Hubble constant. Although this early estimate of the Hubble constant was not very accurate due to the observational limitations of that era, the basic reasoning was brilliant. Most creation astronomers today agree that the universe is expanding as predicted on the basis of Einstein’s field equations along with observations of redshifts. This is sensible science, repeatable and testable in the present. However, in 1931, Lemaître published a paper in which he speculated on how the expansion of the universe began. This goes beyond the limits of science because we cannot test or repeat what supposedly happened in the distant past. Lemaître’s conjecture was based on an extrapolation. He took the current expansion rate of the universe along with the assumptions of uniformitarianism (that the expansion rate has been consistent over time) and naturalism (that God had not supernaturally created the universe), and inferred that the universe has always been expanding since it began as a point of no size – a primeval atom. Over time the idea came to be called the big bang, or the standard model. The uniformitarian assumption is questionable of course. But naturalism is something that any Christian should reject as false because naturalism denies the supernatural. Interestingly, Lemaître professed faith in God. He was an ordained Roman Catholic priest. He apparently rejected the literal history of Genesis, and believed that science and faith were separate issues and that one had nothing in common with the other. Hence, he embraced methodological naturalism. Methodological naturalism is a softer version of naturalism, which accepts that the supernatural might happen, but that when we are doing science, we must pretend that the supernatural does not happen. In essence, the methodological naturalist does science as if he were an atheist, though he might not actually be an atheist. It is a strange position. The methodological naturalist acknowledges that God does or might exist, but does science on the assumption that God does not exist. Is it rational to do science from an assumption that is definitely (or at least possibly) wrong? If a person’s reasoning is based on a false premise, is there any reason to trust the conclusion? Yet, it is surprising how many professing Christians hold to methodological naturalism. Given that Lemaître built his hypothesis on two unbiblical assumptions, we should be very skeptical of his conclusions. Nonetheless, it is theoretically possible for a person to draw a correct conclusion by accident from faulty assumptions or faulty reasoning. So is it possible that Lemaître’s idea of a big bang could be true? Could the big bang be the mechanism that God used to create the universe? Is the big bang / standard model compatible with the history of creation presented in the Bible? In fact, there are many contradictions between the big bang and the Bible. The first incompatibility is the timescale. In the current version of the big bang, the universe supposedly came into existence about 13.8 billion years ago. The Bible states that God created in six days, each bounded by one evening and one morning, which forms the basis of our work week (Genesis 1, Exodus 20:8-11). Furthermore, Adam was created on the sixth day, and from the ages given in Scripture, we know this was a few thousand years ago. An exact date is not needed in order for us to know that 13.8 billion years is far older than what the Bible allows – by a factor of about 2 million. This is hardly a negligible difference. If the height of an average man represented the biblical timescale, then the big bang timescale would be about the width of the United States. Some people have the impression that if they could just stretch the days of creation into vast ages, this would allow the Bible to be compatible with the big bang. Of course, the language of Genesis is very clear and cannot be stretched to accommodate deep time. Nonetheless, it would not resolve the disparity anyway because the order of events differs. The Bible teaches that stars were created on day 4 of the creation week, whereas Earth was created on day 1 (Genesis 1:1, 14-19). However, in the standard model, stars formed billions of years before the Earth. In fact, the standard model supposes that terrestrial planets like Earth formed from elements forged in the core of stars. The creation of stars after the Earth is so contrary to the big bang that some Christians have asked, “Couldn’t Genesis simply mean that the stars appeared on day 4, rather than being made on that day?” The answer is: no. The Hebrew text teaches that God made (using the Hebrew word asah) the lights in the firmament on the fourth day – not that He made them appear, which would be a different Hebrew word (ra’ah). Could it be merely the sun and moon that were made on the fourth day? No. The Hebrew language has a preposition (‘et) (which has no parallel in English) that marks the direct object of the verb. This word is used in Genesis 1:16-18 to mark the stars as the object that God made. The text therefore specifies that the stars are the objects that God made on the fourth day (along with the sun and moon). And there are other order differences. According to the Bible, Earth was created before light (Genesis 1:1,3). However, in the big bang model, light existed billions of years before the Earth formed. The Bible states that liquid water existed before stars (Genesis 1:2, 14-19). But in the big bang view, the oxygen in every water molecule was supposedly produced in stars. In the standard model, the Earth had no water to begin with, but began as magma. So the timescale and order of events of the big bang contradict those of the Bible. The big bang therefore cannot be true if the Bible is; and the Bible cannot be true if the big bang is. But there are additional differences. A significant difference concerns the mechanism by which space, time, stars, and planets were made. The big bang is a naturalistic model. Advocates believe that natural laws can account for the origin of the universe and all the objects within it. God is neither desired nor required. Indeed, the whole point of the big bang is to explain how the universe and its features came to be without invoking the supernatural. But doesn’t the Bible teach that God supernaturally created the heavens and the Earth? To answer this question, we need to define our terms. Unbelievers tend to have the common misconception that the word “natural” means that God is not involved, whereas “supernatural” is when God intervenes. However, the Bible teaches that God upholds the entire universe by the expression of His power (Hebrews 1:3) and accomplishes all His good pleasure (Isaiah 46:10). So everything that happens in this universe is ultimately enabled by God’s power. Natural phenomena demonstrate God’s power just as much as supernatural phenomena. They are equally demonstrations of God’s omnipotence. What then is the difference? ‘Natural’ refers to the normal, consistent, repeatable way that God upholds the universe, and ‘supernatural’ refers to an unusual, extraordinary manifestation of God’s power. Consider the orbits of the planets around the sun. What keeps them from flying off into space? Ultimately, the planets orbit by the will of God, yet most physicists would say that the sun’s gravity keeps them tethered. The two answers are perfectly consistent when we recognize that gravity is merely the name we give to the way that God keeps the planets in orbit. Gravity is not a replacement for God’s power, but an example of God’s power. And since gravity is the normal, repeatable way that God accomplishes his plan, this falls under the category of natural law. Anything that happens normally, repeatedly, or predictably is a natural manifestation of God’s power, rather than a supernatural manifestation. So was the creation of the universe natural or supernatural? During the creation week, God was speaking into existence things that had no previous existence. He created the Earth. He created plants, animals, and people with no ancestors. These are not things that God continues to do today. They are not repeated throughout time, and are therefore supernatural. Genesis 2:2 confirms that God is not doing the acts of creation today that He did during the creation week. This verse states that by the seventh day God completed/ended His work (of creation). Since God is not doing today what He did during the creation week, we can say for certain that the creation week involved supernatural manifestations of God’s power. The creation of the universe, the celestial luminaries, the Earth, and life on Earth therefore cannot be correctly described by a naturalistic model. The naturalistic mechanism of the big bang is fundamentally wrong because it assumes that the universe formed in the same way it is upheld today. The origin of the universe was not a violent, naturalistic “bang.” It was an orderly sequence of objects being supernaturally created as the Lord spoke them into existence. The standard model is not only a story about the past; it is also a story about the future. 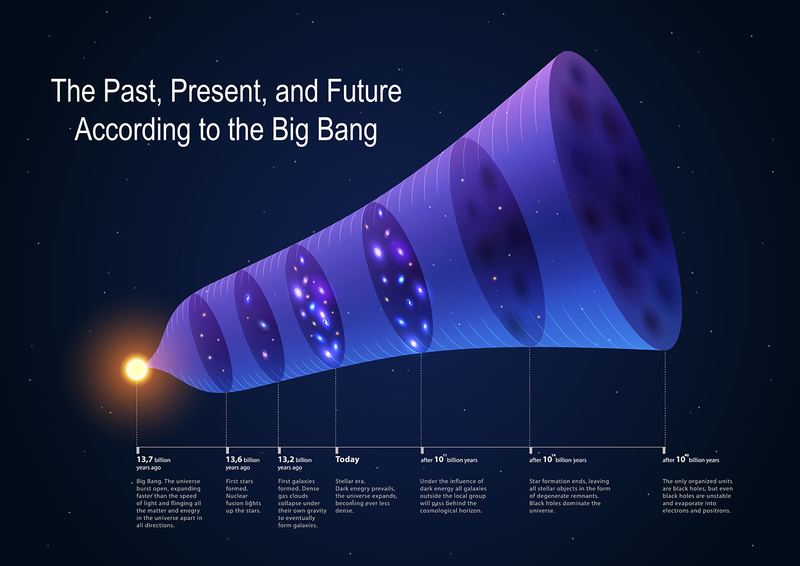 There were originally three versions of the future of the universe allowable within the big bang model. But recent observations have essentially eliminated all but the following position. According to the standard model, the universe will continue to expand forever. Energy will continue to convert from a usable to an unusable form. After eons of time, all usable energy will be gone. In this “heat death” stars will no longer exist, and life will not be possible. The universe will be nothing more than low-energy radiation and black holes. It is a rather bleak view, and one that contradicts the future described in the Bible. The Bible teaches that there will be a future judgment and restoration. The new heaven and new Earth will last forever, and those who have received Christ as Lord will live forever with Him. What is perplexing is that many Christians reject the biblical view of origins in favor of the big bang, while they accept the biblical view of the future while rejecting the big bang’s future. This is dreadfully inconsistent. If we cannot trust that God got the details right in Genesis, then why trust that He got the details right on the future? Some people might object that the future judgment and restoration are supernatural actions by God, and hence a naturalistic model is insufficient to describe or evaluate them. But then again, the Bible teaches that the creation of heaven, earth, and whatever is in them was a supernatural sequence of events. Hence a naturalistic model is insufficient to describe them. Strangely, some Christians have claimed that the big bang is biblical on the basis that it teaches that the universe had a beginning, just as the Bible does. Of course, the Lord of the Rings trilogy also has a beginning. Should we therefore believe that the Lord of the Rings is an accurate description of origins and compatible with the Bible? Clearly, one point of agreement does not undo the many differences between biblical origins and the big bang story. Ultimately, the big bang and the Bible give two very different descriptions of the origin of the universe, and acceptance of one therefore logically requires rejection of the other. The history of secular thinking on origins may shed some light on this issue. In the mid-twentieth century, there were two main secular models of the origin of the universe: the big bang and the steady state model. Both embraced an expanding universe. But the big bang assumed that this expansion began from a point billions of years ago, whereas the steady state assumed that the universe was eternal, infinite in size, and has always been expanding. 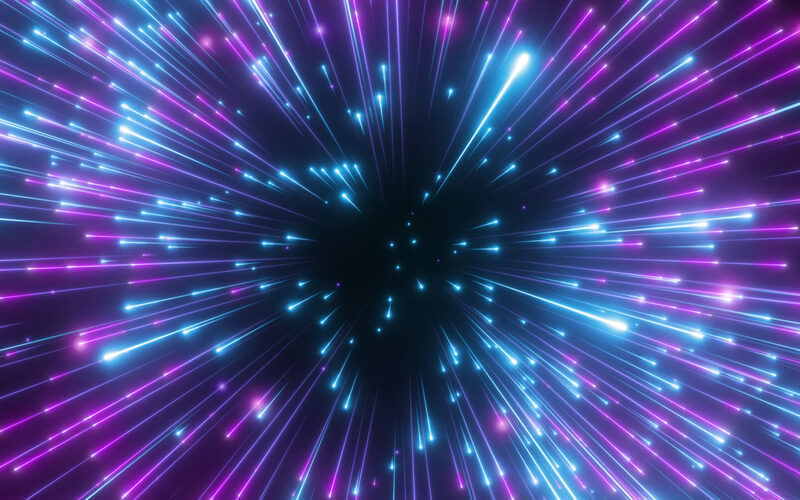 Since expansion would naturally lead to a drop in density, the steady state theory proposed that new matter constantly forms from nothing in the void to keep the average density of the universe constant. Both models were equally consistent with the observations, until 1964. Since the big bang begins with all the energy in the universe concentrated into a point of no size, when the universe first starts to expand, the energy density would be incomprehensibly high. This corresponds to an extremely high temperature, which would produce electromagnetic radiation (light of very high frequency). As the universe expanded, this light would drop in frequency as its wavelengths stretch along with space. In 1964, Arno Penzias and Robert Wilson discovered that low-energy microwaves were traveling through space from apparently all directions: a cosmic microwave background (CMB). Many astronomers immediately assumed that these microwaves were the stretched-out leftover radiation produced in the big bang. Since the steady state model did not predict such radiation, the discovery of the cosmic microwave background was hailed as the proof of the big bang and the refutation of the steady state model. But there are two significant problems with this reasoning. First, we note that the biblical model was not invited to this competition. Only the two most popular naturalistic models were considered – a bifurcation fallacy. We can easily “prove” something that is false by considering only wrong options. Consider incorrect option A or incorrect option B. Incorrect option B doesn’t fit the observations, therefore A. But what about option C? After all, the Bible also teaches that there was light before stars (Genesis 1:3, 16-18), and seems to imply an expanding universe (Isaiah 40:22). So we might reasonably expect to find microwaves throughout space on the basis of Scripture as well. Second, although the steady state model did not predict a cosmic microwave background, no one at the time seems to have considered whether or not it should have made such a prediction. In any universe that has matter with non-zero energy, that matter must radiate electromagnetic energy. Some places will naturally be warmer than others. But over time, the universe will be flooded with radiation corresponding to its average temperature. At an average temperature of 2.7 degrees above absolute zero, the radiation will have the frequency of microwaves. The point is that the existence of a cosmic microwave background is not a unique feature or the big bang model; any universe with an average temperature will eventually have a CMB. The big bang was invented to explain the origin of the universe and its features without God. It is a naturalistic model and is incompatible with the Bible. The big bang differs with the biblical account on the timescale, the order of events, the mechanism, and the future. Therefore, for those who believe the Bible, the big bang is not an option. What remains to be considered are the scientific merits of the big bang. If we did not have the Bible, if we did not know the true origins of the universe, would the big bang be a reasonable scientific hypothesis? More to come. I am not suggesting that this is definitely the explanation of the cosmic microwave background – only that it is a possibility.